There are many ways to clean a marble floor in a commercial setting. Marble flooring can be found in the majority of commercial high-rise office buildings as well as other commercial building throughout the globe. The goal of this article is to provide our commercial readers with information on how to improve their performance and appearance when cleaning marble flooring through the deep cleaning process. This recommended deep cleaning method is designed to be used on unsealed marble floors. Deep cleaning marble flooring is not a new topic but the following is a way to greatly improve the results of deep cleaning marble flooring, contain or control the cleaning budget and perform he deep cleaning task in reduced time as it would with other deep cleaning methods. Please make sure never to use, harsh chemicals when cleaning marble flooring such as vinegar, ammonia or bleach. These common household cleaning agents can damage the marble flooring to a point where it cannot be repaired. What is wonderful about using the following special pad to deep clean the marble floor is it can be performed using a neutral cleaner which not only safe to use on the marble but it is also safer and more friendly to the environment. If you are more interested on cleaning marble flooring for daily cleaning, please click on the link for a prior article written on this topic (Cleaning Marble Floors – Commercial–Steps for Daily Cleaning Unsealed Marble). The key to improved performance for deep cleaning marble flooring is a special pad from Unichem Marketing, called “That’s Amazing” Floor Cleaning Pad. This pad employs a foam material that grabs the floor better than a random woven floor pad such as a traditional red or green cleaning pad. This foam material grips the floor resulting in a better cleaning result. The pad provides incredible cleaning power and because the pad is doing the majority of the cleaning, so only a neutral cleaner is required to deep clean the marble floor. 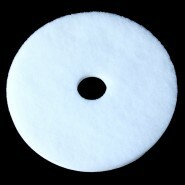 Dust mop the marble floor with a yarn dust mop or Microfiber Dust mop. Microfiber is the recommended method for the best results in removing dust and loose debris from the floors. Use a blunt plastic scraper to remove attached gross debris. Using the “That’s Amazing Floor Cleaning Pad attached to an automatic scrubber and a quality professional grade neutral cleaner, double scrubbing the floor. On the first pass scrub the floor with the solution valve half-open, pads on the floor, squeegee up and vacuum motor off. On the second pass, keep the solution valve half-open, pads down on the floor, squeegee down and vacuum motor on. Allow the floor to dry thoroughly before allowing foot traffic on the marble floor.